Fracking: A Train’s-Eye View | Broadview Collaborative, Inc.
A few days ago, the New York Times ran a piece about increasing rail traffic in the Pacific Northwest due to growing shipments of oil from the Bakken fields in North Dakota, as well as coal headed for westward export across the Pacific Ocean. While this increased traffic is great for the rail business, it means very busy tracks in Spokane, Wash., the pinch point through which the trains all travel. This piece especially caught my attention, not just because it highlights yet another aspect of the water-energy collision, but also because I recently had my own rail journey that turned out to be a bit of a highlights tour through the American fracking experience. Rather than fly home from our family vacation in Seattle and the San Juan Islands in early August, my husband and I decided to take the train. Amtrak’s Empire Builder travels from Seattle to Chicago, going right through our hometown of Wauwatosa, Wis., and has a stop in Milwaukee. Inspired by our son’s use of long-distance rail travel, we opted for this route partly to lower the energy footprint of our travel, and partly as a way to see the country. And what a great way to get an overview of this beautiful country it was! We went north along Puget Sound for a bit, and then headed up into the Cascades for a breathtaking journey that kept me glued to the window until dark. We woke up in Montana, which took the better part of Sunday to get through and included three stops with direct access to Glacier National Parks’ lodges and wilderness, including a link to a rail line that went up into the Canadian Rockies and Banff. Perhaps the biggest surprise was the beauty of North Dakota’s working landscape. Eventually we started to parallel the upper reaches of the Mississippi River, which has its own beauty, and then into Wisconsin with a quick glimpse at the rock formations known as the “Dells” along the Wisconsin River. We wrapped up by passing through Wauwatosa and Milwaukee, seeing our home turf by train. But along the way, we couldn’t help but hear and see the impacts of fracking. Long before we arrived in North Dakota, we passed plenty of freight tanker cars, loaded with what I assumed was oil, which were heading west. Our first stop in North Dakota was Williston, the city that has been the center of the state’s fracking growth. From there we passed through endless wheat fields, regularly dotted with fracking operations. The landscape wasn’t as scarred as I expected, based on what I’ve seen in Colorado, but we were never out of view of a well site — easily recognized by the well and pump, the series of storage tanks, and the ubiquitous flare. A recent report from Ceres pointed out that there are so many flares burning off (e.g. wasting) natural gas coming off of the wells that they can be seen from outer space. Something like $3 million / day is simply burned off because the natural gas can’t be stored for a better use. Seems crazy, but for now that’s the way it is. From North Dakota we started to head southeast through Minnesota, with the next fracking tour highlights. 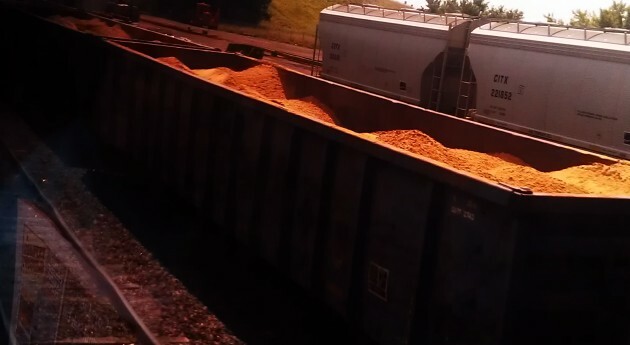 Adjacent to us on the tracks in St. Paul was a string of freight cars carrying sand – fracking sand. If there was any doubt as to where this sand was coming from, we later journeyed right past one of the sources. In Wisconsin the tracks took us practically right through one of the mines – a closer look than I’ve been able to get from any roadside. (Unfortunately the train was moving too fast for me to get a focused picture.) Wisconsin, with its unique sand deposits left behind by melting glaciers, is feeling the fracking boom via the explosion of sand mining. While there are probably some very well managed sand mines, the proportion with known environmental violations can’t be a good sign for this industry. But the world of fracking wasn’t just outside of our windows, it was on the train with us, too. During lunch one day, we met Jim, a California transplant raising his family in Montana. Jim went looking for work when his small engine business started to dry up during the last recession. For the last six months he’s been making decent money by traveling to Williston, N.D., working for a company that services fracking equipment. He works solidly for four weeks, then takes the train home to be with his family for one. We met him as he was journeying back to Williston. For Jim, and thousands of others flocking to North Dakota, fracking means jobs. There was no escaping it. Even when walking through the lounge car, I could overhear pieces of conversations, many of which were about fracking, both the impacts and the opportunities. We set out to see the country, which, as it turns out, has a complicated beauty.